Theravada Buddhist Monks are unpaid and volunteer spiritual teachers residing at centres; supposed to be maintained by their local communities. Lay followers acquire merits by providing FOUR REQUISITES (Cloths, Food, Lodging & Medicine). Recently, special concerns are being made with scientific and other research facts alarming the BUDDHIST MONKS’ HEALTH ISSUES and education of the laity of offering particularly food. Please mind the amount and particularly NUTRIENTS of the FOOD when you prepare. Offer Healthy Food to Monks. Sharing this will help our devotees to prioritize the teachings (Lord Buddha’s Wisdom) rather than their devotion of insisting to eat (Feeding Monks More to acquire merits), as much as possible and also, to mind the fat, oil, sugar, minimizing the amount of curries into three or four maximum, getting more vegetables and fruits, and particularly "over cooking". Of course everyone has a self responsibility on what should and should not be eaten. But it is hard to avoid especially when they are gifts. So think wisely and act moderately. This would save lots of time and money of the devotees. Then they could concentrate more on worthwhile courses (in Dana) like, Dhamma Dana, helping poor, Children or supporting utilities to up keep the centre, which has been a less care. Generally Everyone (as media says: Sri Lankans) is exceptionally GOOD of offering FOOD (Dana) rather enthusiastic to practice Sila (morality) & Bhavana (meditation). Out of compassion for their outstanding hospitality and generosity, let our dearest pious DEVOTEES encourage to concentrate more on Lord Buddha’s Wisdom on Health Issues. Decent and light one meal a day is more than sufficient to lead a healthy life. Fears that monks in Sri Lanka are increasingly contracting diet-related diseases such as diabetes has prompted the authorities to devise a special menu for the clergy. Since monks traditionally do not cook they depend on donations given by devotees. Much of this food is high in cholesterol and lacking in nutrients. To help the monks eat more healthily the Sri Lankan Medical Research Institute has issued guidelines and suggested healthier menus to follow. BBC's Charles Haviland in Colombo reports on the initiative. 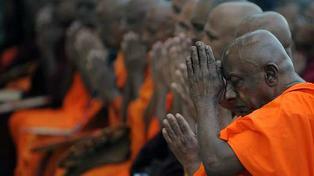 Half of nation's monks at risk of diabetes. Worshippers are being told to give fewer sweet treats to monks amid fears that their diet is too rich. Colombo, Sri Lanka: Sri Lankans are being urged to cut down on offerings of sweets and cakes to the country's Buddhist monks after it was found that half the nation's holy men are at risk of poor health due to a diet rich in sugar and oil. Devotees provide the monks with their food and book up to a year in advance for the chance to cook for them. The food is made with great care and is often extremely rich, but this has led to the alarming statistic that 50% of the island's 40,000 monks are at risk of diabetes, compared to the national average of 10%. The venerated monks are also at higher risk of heart disease, the health ministry says. Officials have now come up with new guidelines to encourage devotees to donate low-sugar, healthier food for the monks' diet instead. The average daily intake of 12 teaspoons of sugar should be reduced to a maximum of eight, according to the new guidelines, while salt should also be sharply reduced. Alms should not include more than one dish containing cooking oil, the ministry added. "Diabetes and other non-communicable diseases among Buddhist monks can be reduced if the faithful follow the new diet guidelines," it said. Buddhism is the majority religion amongst Sri Lanka's 20 million people, who believe offering meals, cakes, biscuits and sweets to monks will bring them good karma in this life as well as in the next. Buddhists who believe in reincarnation also offer food to monks in an attempt to transfer good luck to departed loved ones. But the ministry says the offerings should consist of long-grain rice, three vegetables and two types of fruit rather than cakes and sweet things. COLOMBO: Sri Lanka yesterday unveiled new guidelines encouraging devotees to donate low-sugar, healthier food to the country’s Buddhist monks after warnings that half of them risk developing diabetes. The country’s monks eat food containing on average 12 teaspoons of sugar a day, but it should be reduced to a maximum of eight, while salt intake must also come down, the Health Ministry said. “Diabetes and other non-communicable diseases among Buddhist Monks can be reduced if the faithful follow the new diet guidelines,” the ministry said, adding that alms should not include more than one dish made with oil. Fifty percent of the Island’s 40,000 venerated monks face the risk of diabetes compared to the national average of 10%, and the clergy also suffers a higher risk of heart disease, the ministry noted. The majority of Sri Lankans are Buddhist, and believe offering meals, cakes and biscuits to monks will bring them good karma. It is essential to have healthy monks to represent Buddhism to their villages and to the rest of the world. It is important Monks eat healthy food, chiefly fresh vegetables, if at all possible. This is to function well. It is important Monks get quite a lot of exercises. Monks must not sit for long periods. This is dangerous in the long term. Sitting time should be earned by an equal time spent moving around and exercising. They should exercise well every day to make the heart function properly. Brisk walking or workouts on gymnasium-type equipment too, ropes, bars, are important. All monks must be strong, to face the challenges ahead. health/ blood/ etc., checks once every five years. Dental checks every six months. Monks must brush teeth with paste in the correct manner to ensure removal all food and bacteria. Researchers are revealing the truth about diet - good or bad. They reveal the truth about the need for clean drinking water at certain times of day. Heart failure and disease is explained on U-Tube. The sad stories of the Buddhist Universities of India should be a warning to Buddhists. History has a habit of repeating itself, therefore Monks where exposed, should be able to defend themselves. We are entering a more uncertain world. Monks should receive a news service that keeps them informed of matters of importance. They can then inform their villagers on matters of common interest. Monks must be relevant to the needs of the community. (e.g., Fund raising for poor families). If villagers understand these monk's needs, and Monks practice them, then Monks will gain respect in their communities. It is all about credibility and respect. Dr. R. A. Gunasena has a letter in the Sri Lankan ‘The Island’ (11th October 2012), entitled “Poor Health of Monks”. He gives us the startling figure that 20% of Buddhist Monks suffer from Diabetes and 80% of Monks die of Heart disease. He tells us devotees give Dana that is rich in salt, oil and sugar; all harmful and to be avoided. In the ‘West’ the harmful effects of these additives has been well known for years. American scientists have analyzed the effects on the human body of these additives and their harmful effects have been reported widely upon (- in English) over recent years*. The fructose content - part of all sugar, is little short of poison. But the Sinhalese remain blissfully ignorant and carry on with their old bad habits. Didn’t Venerable Piyadassi Maha Thero write that ignorance is the highest form of corruption? Well, in this case it is killing the monks! Venerable Bodhi Dharma found the same problem; when he finally came down Mount Song to Shaolin Temple he found listless monks. These were strong, powerful soldiers who had retired from the Emperor’s army – all gone to seed. He developed a set of exercises that later became the foundation for the specialized interpretation of martial arts at Shaolin. The Martial arts proved useful, especially when robbers came to steal the monastery's assets. I understand that thousands of student monks and their teachers were slain in cold blood at Taxila University. And the same happened at Narlanda University, too, and some of these were burned to death – a perfectly dreadful end to a noble aspiration. Thousands, literally, of monks were killed in every case. The powerhouse of Buddhism had been gutted. The Muslims call Buddhists stupid. Well, if leadership in today’s affairs of the Buddhist community derives from listless monks, this may well be so. The point of this letter is to strongly recommend that all monks be physically fit and active. This brings several benefits not least the benefit of having better blood circulation. This circulation is important as the brain needs oxygen and nutrients to work well. Countering threats to Buddhism, this person recommends being pragmatic in the face of today’s problems. Ahsima in the face of life-threatening forces should not be taken to an extreme, or to be clung to, tightly: take the middle way – get healthy, get strong, face the challenges – survive to tell the tale! They age more gradually, protecting their lives. Now at that time the brahman youth Sudassana was standing nearby, and King Pasenadi of Kosala addressed him: "Come now, my dear Sudassana, and having thoroughly mastered this verse in the presence of the Buddha, recite it whenever food is brought to me. And I will set up for you a permanent offering of a hundred kahaapanas every day." "So be it, your majesty," the brahman youth Sudassana replied to the king. And also for in the future. Who would have thought weight-loss could be so easy! In this brief exchange the Buddha is suggesting that over-eating is the root of obesity, which hastens the aging process and threatens one's life, and that this only occurs when mindfulness is weak or absent. If we eat slowly and with a great deal of attention, it can more easily become apparent (if we are truthful with ourselves) when an adequate amount of food has been consumed. Interestingly, he seems to be saying that wisdom will provide what is needed to refrain from further eating, rather than the modern conventional view that it requires will-power or self restraint. Always one to play on words, the Buddha says that all our afflictions (literally, all our unpleasant feelings), and not just our bodies, will "become more slender." Perhaps this is what Pasenadi is referring to when he says the Buddha's teaching has not only helped him slim down his body (the immediate benefit), but the general increase of mindfulness and diminishing of greed will help with all aspects of the spiritual life (and thus with his rebirth in the future). The commentary to this text informs us that the king did not engage Sudassana to utter the verse throughout the entire meal, but only once he had started eating. The idea is not to cultivate an aversion to food, for food itself is not an evil. As with so much else in the Buddha's teaching, it is a matter of understanding cause and effect, and of using food skilfully as a tool for awakening rather than allowing oneself to be caught by the latent tendencies of attachment, aversion and confusion that might be evoked by our relationship to food. Notice the language of the last line of the Buddha's verse. The word for life (aayu) is the same one as in the Indian medical tradition of Ayurveda (=knowledge of life), and is regarded as something that can be squandered or carefully guarded. When approached with care, the preservation of life also slows down the aging process. The image is not one of conquering illness or death (for this comes only from full awakening), but of treating the precious resource of one's own vitality with wisdom.